People are more familiar with sunburn, which is the darkening and the drying of the skin because of the exposure to the sun. Another danger, that as painful and irritating, is lip burn. Lip burn is the drying up of the lips due to exposure to the heat of the sun or to the exposure to dry winds that rob the lips of its moisture. You will know if you are experiencing lip burn if you feel that your lips are burning like a hot coal. The symptoms of lip burn are dry and chapped lips, and the lips’ skin is peeling away. Bleeding may also be experienced if the because the peeled away skin leaves some wounds. The best way to prevent lip burn is to drink lots of water and the use of lip balm. One lip balm that I used and I recommend is Chapstick. Chapstick give immediate relief to lips experiencing lip burn. After applying Chapstick to your lips, you will instantly feel the cooling effect of this lip balm and the burning sensation will be reduced. After few hours of applying Chapstick, the skin of the lips will peel away painlessly. Chapstick will restore your lips to normal after few more applications. Another things is that it has some pleasant flavor. What I bought is the classic spearmint flavor. The flavor makes me think of eating the lip balm like candy. Other flavors are cherry and peppermint. It cost about 66 Pesos (or about 1 and a quarter US Dollars) when I bought from a drugstore. What I bought is the classic spearmint. Aside from the classic "flavor" there are also other "flavors" like cherry. 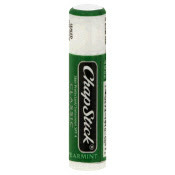 Chapstick is a good lip balm and gave me instant relief from lip burn. I do not have the habit to protect myself from the elements during fieldworks. However, because of Chapstick’s good job, I am definitely including it my backpack to protect my vulnerable lips. Chapped and dry lips are painful and irritating and I do not want to experience those things again. Chapstick will serve as my shield against lip burn. Visit my personal blog Before the Eastern Sunset. I almost chewed this lip balm. It is just like bubble gum.